Restless artists Kristi Stassinopoulou and Stathis Kalyviotis have been shaking up the world music landscape for quite some time now and every new album is a revelation. This time instead of composing their own music, they reinvented Greek folk songs. 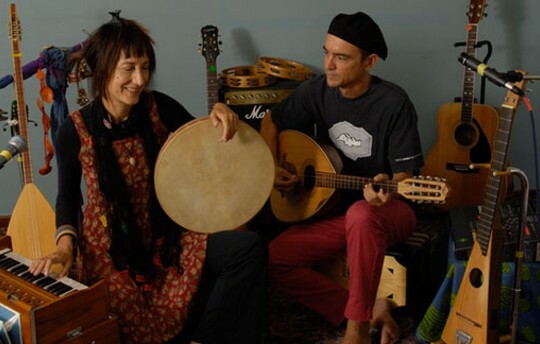 They are currently on tour in Europe presenting their latest album Greekadelia (Riverboat Records, World Music Network, 2012). Greekadelia with its mesmerizing soundscapes has topped the world music charts and has received numerous positive reviews. ελculture spoke with Kristi Stassinopoulou about the tour, inspiration, the way their music is received and their potential future plans. ελc: Currently you’re on tour mainly in Europe. How has the audience abroad received your music and what are their comments about it? Kristi: Stathis and me, we just returned from a tour in BeNeLux and in Denmark feeling happy and fulfilled by the very warm response of the local audiences everywhere we played. It’s been more than a decade now that our music has been drawing attention from outside of Greece. We’ve been honoured by very good reviews from the international media, frequent airplay of our songs, and top positions of our albums in the world music radio charts. So as a result we have been touring all over the world together with our band for many years. This last year we are mainly presenting our latest album titled “Greekadelia”, which for the first time is not including songs of our own, but arrangements of Greek demotika, folk songs from different rural areas of our country. And we are happy to have found out that the audience very much likes the way we are presenting these folk songs, using this peculiar mixture of traditional acoustic instruments, like the laouto and the frame-drum percussions, together with my Indian harmonium and with Stathis Kalyviotis live looping on them in a most genuine and impressive way. In between the songs I often do short narrations that help the foreign listeners dive deeper into the atmosphere of the era and of the area of Greece where each of these songs was born and sung for centuries. People always come after the concert to tell me how much they enjoy this. Then as the concert goes on and things get warmer, we often like to expand the songs and go into electronic and vocal improvisations and that is when people are usually starting to also move and dance and get… Greekadelized! ελc: How easy or difficult is it every time you set out for a new album? Is inspiration coming from within or do you draw inspiration from people/ situations/places surrounding you? Kristi: From within, from without… inspiration is there all the time, is everywhere, apparent and shining like a bright sun, or secret and hidden and then suddenly appearing, like a new moon. Inspiration is there when travelling, when meditating, when struggling to survive, when driving your car in the traffic jam of a big city, or when listening to the waves of the sea from within your sleeping bag on a faraway beach, when in love, when in a yoga asana, when washing the dishes with the pouring water producing all those peculiar sounds on the metal surfaces… Everything can be a source of inspiration, if the mind is constantly alert and ready to receive it. ελc: Your latest album went really well and its reception internationally is uplifting. Does this fuel you with more energy? Do you feel that your music reaches out to more people and cultures? ελc: Do you feel that your music artistry is a window to Greek culture-traditional and contemporary -especially now that Greece is on the spotlight because of the crisis? Is art a way to export a feel good impression about Greece? Kristi: Yes, I do feel that with our albums and with our live concerts out there, we are opening a window of communication and respect for our country. Wherever we find ourselves in the world we are receiving big interest and sympathy for Greece and for its people, which is very moving. Through our music and in our concerts, people are receiving a nice and positive “breeze” from Greece, which, believe me, is sometimes a very hard work to do… Because all of this, we are accomplishing it all by ourselves, without any help of any kind from any Greek organization ever. I agree with you and I keep saying to everybody, that Greece should stop relying only on it’s ancient achievements and look a bit forward and start to support and present also it’s contemporary culture and not only it’s ancient “marbles”. ελc: Tell us a bit more about your upcoming tour dates in Greece and abroad. For example, Benelux is always among your tour stops, it seems like you’ve established an audience there. On the other hand, in a recent interview for the Swedish magazine LIRA, you mentioned you have never performed in Sweden so the concert in Gothenburg will be your first one in Sweden. How excited are you to play for a new audience? Kristi: It is always exciting to be visiting a new country to play your music. The relationship that is being created between the artist and the audience during the live performances is an important and deep relationship. In each and every honest performance the artist gets “undressed” in front of the eyes of the listeners, but also the listeners are becoming transparent to the eyes of the artist. Through the eyes and through the body language of the people I am somehow “catching” the soul of each listener, of each audience, the vibe of each different city, each different country. I feel that I am learning a lot about the people through this temporary but strong relationship that is being created during a concert. This is what I mostly enjoy in this interesting on-the-road adventure, which I don’t like to see as a “career”, but mostly as a collection of experiences and friendships. Now speaking about Scandinavia… Partly because of its magical long days and nights, partly because of its history and its ancient pagan religions, for me it is one of the mythical areas of the world, that I very much like to get to know and explore as a touring artist. ελc: Given the fact that Greek folk music is inexhaustible what are your plans for the future? Do you want to keep busy on the same artistic form for the foreseeable future or would you like to explore something different? Kristi : I don’t like to make plans that have to do with my creativity. I prefer to let things go with the flow in this ocean of vibrations called music… There are many different ideas and wishes in my heart about future creations and it is often difficult to me and to Stathis to decide what we continue and what we leave aside… So we let it come and reach us by itself and this, at least until now, has been working well for us.